Creole Restaurant & Music Supper Club, in association with Brownstone Entertainment Complex, LLC proudly present “The Jazz Legacy Series”. Brownstone Entertainment; Bringing Jazz back ‘Uptown’…..to what was once the ‘spawning ground’ of the ‘Be-bop’ Era, and its’ Traditions…..
“It was clearly The Highlight of the Mellon Jazz Festival! 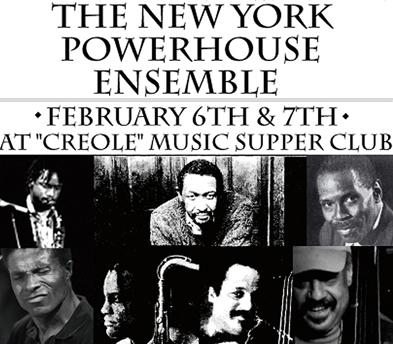 The work of The New York Powerhouse Ensemble at “The Crawford Grill”, stood far above all the other festival events because of the sax mans’ (Abraham Burton) playing and the work of the rest of the group, led by Hill District native; Bassist Mickey Bass, and featuring pianist John Hicks and Drummer Eric Allen. On Friday and Saturday Nights; two shows nightly, at 8.00pm and 10.00pm. There will be a $20 Cover Charge, and a ‘2 drink’ minimum.